Also known as the Symbol of Faith, the Pistevo (Greek for “I believe”), or simply “The Creed” — the 12 articles of the Nicene Creed were prepared with great wisdom and prudence, as well as with the guidance of the Holy Spirit. Preserved and handed down throughout the centuries, the Creed expresses the Christian faith in a concise way. “He who has an ear, let him hear what the Spirit says to the Churches”(Revelation 2:7). The Creed is not merely a bunch of lifeless words that no one really believes, but a crucial part of Orthodox Christian life and worship. This is why in our church today, the Creed is still sung by all the believers gathered together for the Sunday Liturgy. Would attending the monthly Sheffield Saturday liturgy be enough to become orthodox? I’m catholic but have done a lot of reading and attended a few of the liturgies a couple of years ago but never stayed to talk to anyone. Thank you for your email. Sorry to have been so long in replying: I don’t often look at this part of the website. My real email address is: father.edwin@gmail.com. I think we really need to talk this through. When and where can we meet? I am in Sheffield most Friday mornings, but perhaps that is inconvenient for you. 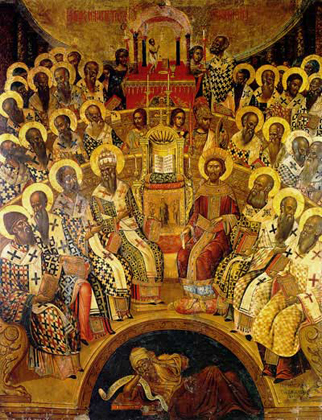 Having read a little of some of the early saints of the orthodox faith I noticed, when I recently joined our local C of E congregation, a difference between the creed they recite and the above (Nicene) creed. The creed recited at you C of E congregation may be the Apostle’s Creed. It is a more basic, though not necessarily earlier, statement of faith. It is mentioned by St Ambrose of Milan in the late 4th century but not quoted in full. It’s current form may not date until the 8th century, but like the Nicene Creed its statements are all to be found in the New Testament writings. It is also known as the “Roman Symbol”, which is why historically it is more widely used in western churches like the CofE, whereas the Orthodox churches have tended to use the Nicene Creed because of it being approved by the first two Ecumenical Councils. After the service (between 12:30 – 1pm) there will be food and drink and we usually chat and catch up with each other. This would be a good oppurtunity for you to talk with the priest, Fr Edwin, about conversion. If you cannot come but still want to talk with a priest, then Fr Edwin’s email address is: father[dot]edwin[at]gmail[dot]com (replacing the [dot] with . and [at] with @). I am seeking an Akathist written in English, to Saint Paraskeva the New. I found the website for your Church while searching the internet for this Akathist. I live in the USA. Can someone please direct me so I may acquire the Akathist in English for Saint Paraskeva the New?